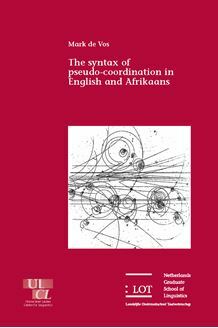 The dissertation provides a systematic description of English and Afrikaans verbal pseudo-coordination and a formal analysis couched in the Minimalist program. It has implications for the way narrow syntax conjoins categories and features and argues for a role for syntactic operations below the level of the head. The dissertation also has consequences for the nature of head­movement, excorporation and its triggers. Verbal pseudo-coordination typically involves an aspectual verb coordinated with a lexical verb. This dissertation argues that verbal pseudo-coordination is not a unitary phenomenon and can involve coordination of verbal heads rather than phrasal categories. The analysis allows a treatment of pseudo­coordination as ordinary coordination rather than as subordination. The typology of verbal pseudo-coordination is extended with a discussion of reduplicative coordination and Afrikaaans pseudo-coordination with verbs of posture. It is shown that coordination can target features at or below the level of the head and that this allows strong conceptions of the Coordinate Structure Constraint and the Law of Coordination of Likes to be maintained.